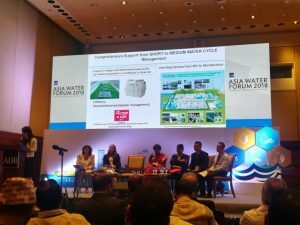 The Asia Water Forum 2018 was held at the headquarters of the Asian Development Bank (ADB) in Manila, The Philippines, from 2nd to 5th October. The purpose of this international conference was to provide a platform for sharing knowledge and experience on water information, technology and innovation, which will contribute to the improvement of projects for tackling water challenges across the region. 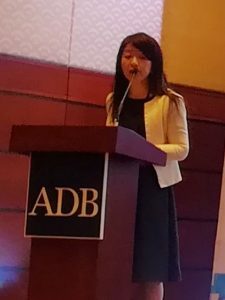 It will also help achieve the ADB’s action plan up to 2030: “Strategy 2030”. 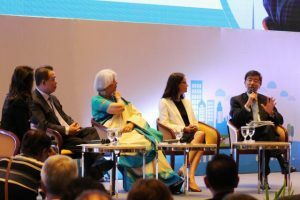 The meeting was attended by more than 800 representatives of governments, businesses, research institutes, and NGOs from not only the Asia-Pacific region but also some developed countries. 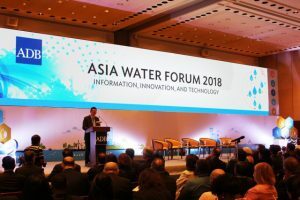 After water operators made presentations on their projects and private companies showcased their products and services, participants discussed ways to identify and adopt innovations that best address the requirements for a water-secure Asia and Pacific region. 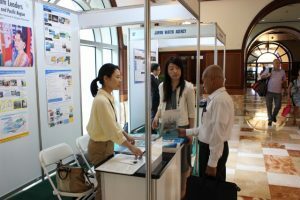 In addition to the Japan Water Forum (JWF), more than 10 JWF member organizations participated, including Nihon Suido Consultants Co., Ltd, Yachiyo Engineering Co., Ltd, Nippon Koei Co., Ltd, Japan Sewage Works Agency, and the Japan Water Agency. The JWF made a presentation on Financing to Support Sound Water Cycle Management in the session on Governance and Financing as part of a follow-up to the outcome of the Third Asia-Pacific Water Summit. We also strove to spread information about the efforts of governments and private sectors in the Asia-Pacific region, including Japan. 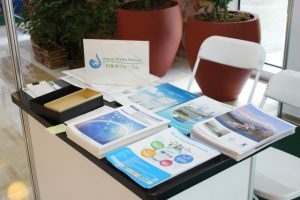 The JWF also ran exhibition booth to showcase products and services related to water & wastewater treatment developed by JWF member companies, and provided information about Japan’s activities regarding water cycle management. Fortunately, we were able to attract the attention of participants and ADB officials. Copyright JAPAN WATER FORUM, All Rights Reserved.